Jerome has always loved bringing a smile to others! He began his entertainment career as a youngster – performing in various church programs and in skits at church camp. While in middle school, he enrolled in theatre classes, performing in plays and developing comedic dance routines and skits for the school’s pep rallies. He was involved in drama and acting throughout his high school years and was the school’s mascot during his senior year. Being the first male in school history to don the uniform, he had the privilege of developing a new character and persona “Eugene the Unicorn”. During his senior year “Eugene the Unicorn” was responsible for returning the school spirit and pride back to the community of New Braunfels, TX. Through his entertaining antics and famous stunt of climbing on the press box of the cross-town rival – the Canyon Cougars – “Eugene the Unicorn” will forever be remembered as a New Braunfels Icon. Following graduation, Jerome was blessed with an opportunity to train with former NBA Spurs “Coyote” Tim Derk and experienced his first taste of being a professional mascot by shadowing “The Fox”, the mascot for the WNBA San Antonio Silver Stars. At that time, Jerome continued his mascot career by “traded costumes”, to become “Boko the Bobcat” while attending Texas State University in San Marcos, TX. During his time at Texas State he revitalized a virtually non-existent mascot program and was responsible for the development of many traditions that still take place during the University’s sporting events. In 2006, Jerome competed against other university mascots in Las Vegas, Nevada and was crowned the 2006 USA National Collegiate Mascot Championship. During his time in college, Jerome also had the privilege of performing and animating numerous other characters, such as “Trigger” for the Austin Wranglers – an arena football team; also “E-waste Eddie”, “Tony the Tiger”, “Fred Flintstone”, and “Pedro the Pinata”. Jerome’s professional mascot and entertainment career began when he was contacted by Spurs Sports & Entertainment and was hired as the main mascot assistant. He assisted the NBA Spurs’ “Coyote”, the WNBA Silver Stars’ “The Fox”, and the AHL Rampage’s “T-Bone”. There he continued to train and develop, working all the games, and was responsible for the new development of the interactive school assemblies, serving as the official spokesperson for the Spurs Sports & Entertainment mascot program. He also had many great opportunities to work alongside some of the best performers in the business, including Robert Boudwin – the Houston Rockets mascot “Clutch”, as well as mascot personnel from the Dallas Mavericks, the Boston Celtics, the Texas Rangers and the Houston Astros, just to name a few. Early in 2007, Jerome was selected out of a nationwide search as a finalist for the New Orleans Hornets mascot position. Though he suffered an unfortunate accident that resulted in a broken leg during his audition, he was still selected as one of the top three finalists. However, with the season soon to begin, and the injured leg not being able to perform at the highest level possible, the New Orleans Hornets were forced to go with another candidate. Soon after that the San Antonio Express News called upon Tim Derk and Jerome to assist with development of their new mascot “X-tra the News-Hound”. “X-tra” was debuted during a San Antonio Missions baseball game and still continues to be a fan favorite when Jerome performs during games and at other Express News events. From witnessing Jerome’s performance during the New Orleans Hornets auditions, the Original “Philly Phanatic”, David Raymond, contacted Jerome about joining the NCAA and performing with their “JJ Jumper” mascot program, where he traveled the nation performing at various colleges and at the Men’s Final Four festivities that took place in San Antonio, Tx. In 2008, Jerome was promoted to Interactive Entertainment Representative for Spurs Sports and Entertainment. He performed as “T-Bone” for the San Antonio Rampage hockey team, served as a back-up Spurs “Coyote” and the Silver Stars “Fox” performing during community events over 200 times a year. While performing as “T-Bone” – he developed the character to be considered the best mascot in the entire AHL, developing schools shows, comedic skits, as well as appearing as a “Top 10 Play of the Day” on ESPN. Because of Jerome’s creative and interactive entertainment expertise, he was asked to assist the Spurs in the development of the fan group “Silver and Black Pack” and management of the new fan interactive group, “Team Energy” which is considered one of the best interactive teams throughout the entire NBA. At some point in time, (only God knows WHEN) Jerome was interviewed by the Harlem Globetrotters to travel with them and animate their mascot “Globey”. However, Jerome turned down their offer because he did not want to have his spontaneity and fan interaction squelched by rigid formats and canned skits. Because he thrives on fan interaction, Jerome began to dream and formulate ideas for developing his own character – “Funkey Munkey” – which has now come to fruition in the establishment of Higher Impact Entertainment. After leaving Spurs Sports & Entertainment at the close of the 2011 season, Jerome founded Higher Impact Entertainment. 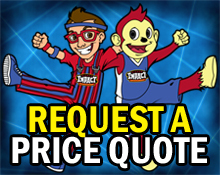 Through his experience of working in professional sports entertainment, his desire is to continue catering to the needs of the younger generation by providing educational encouragement as well as family friendly entertainment that will leave a lasting impression. 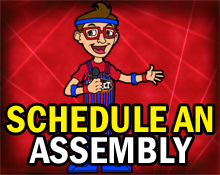 In the summer of 2011 Jerome teamed up with Rally Entertainment, a traveling entertainment group. Serving as the General Manager, Jerome handled all operations for the entertainment group and performed at different minor league baseball games across the nation. Higher Impact Entertainment became the Official Sponsor of the newly relocated San Antonio Talons’ mascot program in 2012 and again in 2013. Overseeing the mascot operations and community initiatives the San Antonio Talons mascot, “Swoop” quickly became a household name and loved by all. 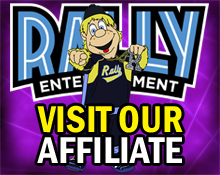 In November 2012, Higher Impact Entertainment purchased Rally Entertainment, and will be continuing the legacy Rally had achieved since 2003 during its 14 season in 2017. From 2013-2016 Higher Impact Entertainment served as an official sponsor of the San Antonio Missions mascot program. Thanks to Jerome’s efforts, Ballapeno, the San Antonio Missions mascot was voted as the best mascot in the Texas League and was voted as one of the best mascot performers in all of Minor League Baseball. In 2016, Higher Impact Entertainment team was an Official Sponsor and Partner of the Round Rock Express’ mascot program. Jerome and the Impact Team brought their mascot character “Spike” to life during home games. Jerome and the efforts of Higher Impact Entertainment’s team of performers have garnered numerous appearances on local media stations nationwide as well as National Television shows such as HBO’s Last Week Tonight with John Oliver, National Geographic Channel’s The Big Picture with Kal Penn, NBC’s First Look, TruTV’s Top 20 Funniest, and many others. Overseeing operations as well as performing in and out of costume Jerome hopes and dreams that Higher Impact Entertainment will continue to capture many hearts, make lasting impressions, and will encourage everyone to #betheimpact.